"Collaboration" is the buzzword of our time. Every computer company has delivered a white paper or announced plans for tools that manage the sharing of publications, documents, messages and information to facilitate collaboration. But most businesses struggle to convert all that rhetoric into profit. 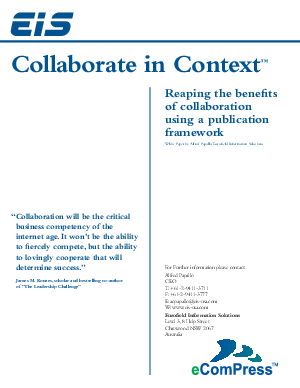 This white paper addresses the role of collaboration in the preparation, management, maintenance and use of authoritative reference publications in modern companies. It is specifically concerned with how workers interact with reference publications and, most importantly, how the knowledge they glean while using those reference works can be captured and shared for individual, community and corporate benefit.